Meet in Ireland is the official Business Events Bureau for the island of Ireland. To deliver a best in class website that showcases Ireland’s Business Tourism offering and acts as Ireland’s shop window for international meeting planners. Within its first 12 months the new meetinireland.com website has exceeded targets and delivered opportunities worth in excess of €35m to Ireland’s Business Tourism Industry. The website has experienced 75% increase in visits and is a primary tool in promoting Ireland’s MICE (Meeting, Incentive, Conference and Corporate Events) reputation as a knowledge economy and developing business tourism destination awareness to an overseas audience. 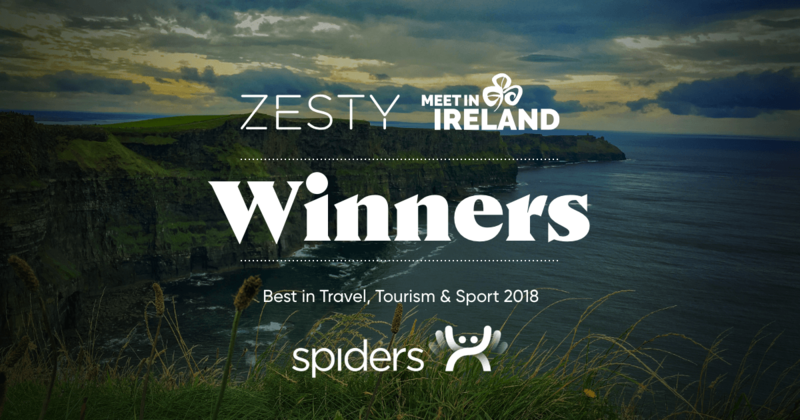 The site also won a Spider Award for ‘Best in Travel, Tourism and Sport’. Read more about the win here. Across all projects Zesty adheres to user-centred Design principles, which begin and end with the target audience. This ensures site structure, navigation and content meets the users’ needs at all times and is focused on enabling all potential visitors to easily fulfil their top tasks when they visit the website, for example, completing a ‘Request for Proposal’ was a priority task on the new Meet in Ireland website. The initial consultation stages are critical to the overall success of the project. The quality of information and research collated determines the quality of the website. For this reason, we place strong emphasis on our User Experience (UX) process, as a fundamental part of our Project Framework. Our starting point for every project is to gain an in-depth understanding of user groups, their objectives, needs and motivations. We understand that clients know their own business best therefore we see this process as a partnership, with both parties sharing and feeding information into the UX process. Through the UX stage of the process, we worked with the Meet in Ireland team to fully explore their visitors, where they’re coming from and their reasons and motivations for visiting the site. 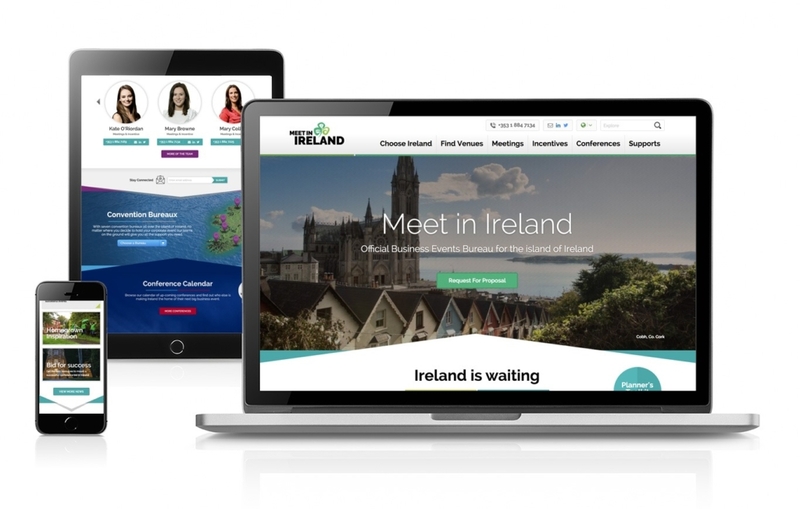 In terms of both look and feel and functionality, the MeetinIreland.com website was developed to provide the best user experience on a desktop device. The target audience is B2B Event and Meeting organisers and our analysis illustrated that due to the form interactions that require keyboard entries, their research was completed on a desktop. Therefore, we built the site with a desktop first design and mobile responsive design. Assets such as imagery, video and infographics are displayed in large format for the best experience. The site has been structured to allow the content to resize and reorder to be optimised for a mobile experience where page length is kept to a minimum and page speed is a priority. Meet the Team section was created to personalise the experience for Business Tourism users who were researching locations for Meeting or Event venues. Google map integration – pins for accommodation / venues / travel options. We created a personalised user experience with the development of a Google Map based trip planner and route explorer. We included the ability to conduct on-site searching to ensure users could find the information quickly and easily. The site was integrated with Fáilte Ireland’s CRM platform, allowing the Meet in Ireland team to easily access user information to collate information and qualify leads generated. The site was integrated with an interactive services provider ‘Tourism Content Service’ (TCS), we utilised API integration and iframes. Our Project Team managed the delivery of the meetinireland.com website from initial brief, through to execution and review. There was a dedicated Account Manager and Support Team available at every stage of the process to ensure deadlines were met and key project milestones were achieved. Our Insights Team monitor site performance and user behaviour with Google Analytics, we have seen see an exceptional improvement in site performance. Overall the site has experienced 75% increase in visits – an impressive uplift which demonstrations the improvement of Meet in Ireland’s website offering. There has been a 64% increase in users, all of which are new users to the site, this is significant as attracting new visitors was a key objective of the project. The engagement results are also very encouraging, the number of visits per user has increased by 7% and the average session duration has increased by 5%. This illustrates that users are returning to the site more frequently and they are spending longer periods of time on the site consuming content. A 60% increase in organic visits illustrates a vast improvement in the site’s organic ranking, a direct result of the SEO implementation carried out during site development. The awareness results are significant, they illustrate a dramatic increase in brand awareness and consideration from users outside of Ireland. Key highlights; the site received over 200% additional visits from users based in the USA, there was over 45% additional visits from UK and just under 50% additional visits from visitors in Canada and Belgium.